Jessamy Harrison is eight years old. Sensitive, whimsical, possessed of an extraordinary and powerful imagination, she spends hours writing haikus, reading Shakespear, or simply hiding in the dark warmth of the airing cupboard. As the child of an English father and a Nigerian mother, Jess just can't shake the feeling of being alone wherever she goes, and the other kids in her class are very wary of her tendency to succumb to terrified fits of screaming. When she is taken to her mother's family compound in Nigeria for the first time, she meets her uncles and aunts and cousins - and her formidable old grandfather. Then one day, in the deserted Boys' Quarters, she encounters Titiola, a ragged little girl her own age. It seems that at last Jess has found another outsider who will understand her. TillyTilly knows secrets both big and small, and some she won't reveal. But as TillyTilly shows Jess just how easy it is to hurt those around her, Jess begins to realise that she doesn't know who TillyTilly is at all. Lyrical, poetic and compelling, The Icarus Girl is a novel of twins, doubles and ghosts, of a little girl growing up between cultures and colours. Helen Oyeyemi was born in Nigeria in 1984 and moved to London when she was four. 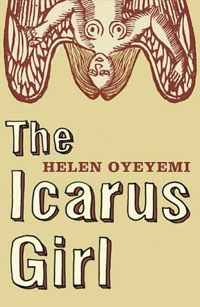 She wrote The Icarus Girl while she was still at school, studying for her A levels, and is now a student of Social and Political Sciences at Corpus Christi College, Cambridge.